Nestled in Black Hills, with spectacular views of the Sturgis area, Big Rig RV Park is one of the unique Sturgis campgrounds for the Sturgis Motorcycle Rally. We offer several features that will make your stay comfortable during the Sturgis Motorycle Rally. Continuously connected full service hookups including 30/50 amp electricty, water, sewer, WIFI, and a shower facility. We have an easy automated website reservation booking process. We are just 3 minutes away from downtown Sturgis. We have very competitive rates for the Sturgis Motorycycle Rally. We have Wi-Fi that actually works. We have nice clean showers and restrooms. Long Pull Through Sites (Easy in-Easy Out) - You can leave your trailer attached to your rig! We have spectacular views of Sturgis and the Black Hills. Although close to downtown Sturgis, it's away from all of the noise. We won't leave you hangin. We have laundry facilities on our property. 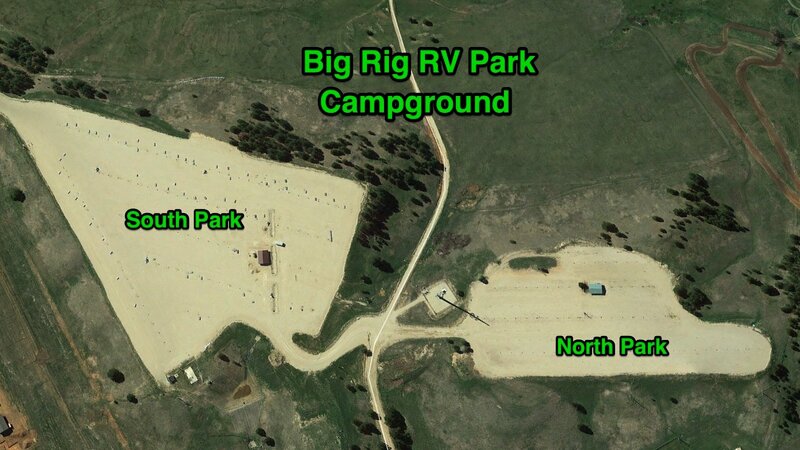 Big Rig RV Park Campground is one of the oldest campgrounds for the Sturgis Motorcycle Rally. Big Rig RV Park Campground is located in Sturgis, South Dakota and we are open exclusively for the Sturgis Motorcycle Rally. The campground is perched on top of a hill and has spectacular views the Sturgis and the Black Hills area. We are just two miles from the legendary Sturgis Main Street with very easy access to I-90, Boulder Canyon, Vanocker Canyon, and other Black Hills attractions. We have a variety of lot campsites especially lots with spectacular views of the beautiful Black Hills. Our campsites feature full service hook-ups including water, sewer, 30/50 amp electricity, and WIFI that actually works. Our campsites have a gravel surface and are nearly perfectly level with little or no blocking required. We have two campgrounds, the original North site launched in 2000, and the South site constructed in 2015. Both sites include a very clean men’s and women’s shower-house. The official dates for the 2019 Sturgis Motorcycle Rally are Friday, August 2nd thru Sunday, August 11th, 2019. However, many of our guests arrive early or come in later in order to avoid the crowds. We are open from Friday, July 26th thru Tuesday, August 13th. We have 8 different schedules to accommodate your travel plans. Please come stay with us to enjoy the 2019 Sturgis Motorcycle Rally. Are you ready for the 79th Rally? We hope you are as excited as we are about the grandaddy of all motorcycle rallys!